20 individually packed plasters in box. 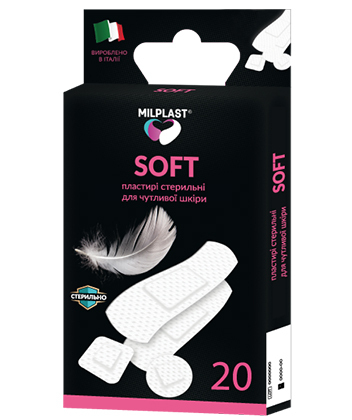 Milplast Soft sterile plasters are ideal for sensitive irritating and allergic skin. We recommend to apply these plasters for small abrasions, cuts and calluses. The plaster elasticity, as well as its different shapes allow its application on any skin area. Milplast Soft can be removed easily and painlessly, without remains on the skin.